Yay! Our guest blogger today famous author Alan ‘Key’ Bennett, with his glorious monologues about life and his mother, take it away Alan! It was not a particularly adventurous order – two slices of wholemeal, browned but not burnt, two butters and no jam delivered with the lack lustre flair and grace of an aged stripper from a bored girl with black hair but it suited the surroundings, a department store of no repute, perfectly. Optimistically called Zest, the restaurant, if one could call a self service cafeteria a respectable establishment, remained empty. The two slices, uncut and a little burnt around the edges, looked disappointed. I turned them over to check both sides and fumbled with the small packets of melted butter from my plastic chair. The knife was dirty and a thin film of grease covered the once clean table. I ran my finger across the the cheap finish, noting with some distress that it felt gritty with the dirt of others, the dirt of life my mother might say. She said things like that you see, my mother. Opposite a grey haired gentleman had a similar problem. his toast was also burnt and he used the back edge of his knife to trim away the black. His face hinted at unhealthy thoughts as he hacked away harder, pausing only to cough up a years worth of flem. Stop, stop it right there Alan! I know you’re a top writing chap and all that but hey, lighten up a little, this is a happy blog, use happy words! It was a marginally happy order – two slices of wholemeal, averagely toasted, two butters, sans jam delivered with a flair and grace of a bored but smiley stripper from a girl with dark hair but it suited the surroundings, a light and airy department store, perfectly. Called Zest, the restaurant, a self service cafeteria was a respectable establishment but remained delightfully empty. I however felt dismal in such surroundings and I noticed with alarm the salt pot was half empty and the previous diners had left crumbs in the sugar. The dirty, grotty people tainted with the colour of life as my mother might say. She was a miserable sod, my mother. FFS Alan, keep it upbeat! One last try, think positive, positive, positive! I was happy, hap…hap…happity and it was with delight I ordered perfectly toasted toast that arrived delicately delivered with lashings of butter, no jam as requested at the Zesty, Zest, Zest restaurant that was so delicately decorated they had even sprinkled crumbs in the sugar for me to nibble on. That’s it keep it up! No Alan! Don’t go there! Think frolicking lambs, think puppies! 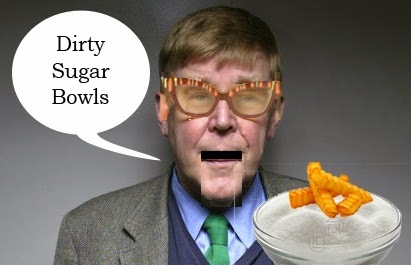 Forget about the sugar Alan! It was positively vile, I rue the day I ever entered. The sauce in those brown sticky bottles should have been a warning sign it was for common people, or as my mother used to say, for the great unwashed of the world. Alan! That’s terrible! You’re banned from the blog for life, you can’t be rude like that! Sorry about that, Alan can be kind of difficult. Instead here is one of Alan’s delightful little poems from a few years ago to see us out. Who’s life Mary had taken. Mary loved ham but hated Harry, he often left crumbs in sugar bowls and as his mother always used to say, dirty deeds bring dirty deeds and Harry had been very dirty indeed.